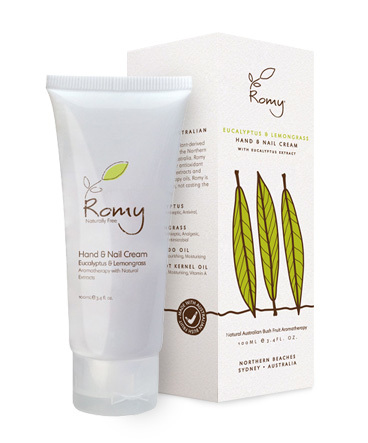 ROMY Eucalyptus & Lemongrass Hand & Nail Cream absorbs quickly into the skin. It does not leave hands greasy and the wonderful aromas linger on the skin. It is packed with green tea and lemon grass extracts, as well as apricot, eucalyptus and avocado (Vitamin E) oils. Apply generously and work into the hands and nails. Use frequently, any time your hands need pampering. "This is by far my favourite hand and nail cream. I keep it in my handbag at all times and use it throughout the day to freshen up. Due to the anti fungal elements of the Eucalyptus I use it regularly to have a quick hand cleanse after meetings, when I've had to meet several people and shake many hands in one go! The scent is my favourite of all the Romy products. Highly recommend trying it out. "